Why do we light firecrackers and give out red envelopes for the Lunar New Year? A warm look at the Chinese legends and rituals of one of the most important festivals in the world. The Lunar New Year is a joyous, noisy winter holiday — its days are filled with parades, firecrackers, and bright red signs and banners with good-luck messages. For people in many countries around the world, it’s a time for annual family gatherings that feature special gifts and meals … and more firecrackers. If you’re ever wondered: Why firecrackers? What do those red signs say? these traditions are tied to an ancient Chinese legend. She was skeptical, but the beggar said, “Just leave it to me. I have a secret weapon to help fight this thing.” Although she let him stay at her house, she departed with everyone else. That night, the monster came to the village and saw candlelight shining in the window of one house. He approached the door, licking his lips, ready to pounce on the poor victim inside. But before he could enter, he saw three red banners that had been hung around entrance and he paused. The energy radiating from the talismans made him dizzy, but he was too hungry to care. He went on, desperate for a late-night meal. Suddenly, the old man appeared. He tossed bamboo sticks into a bonfire that he’d prepared earlier. When the bamboo heated up, the air sealed in its hollow chambers expanded, and produced an explosive “Boom!” The noise startled the monster, and he ran away, never to be seen again. That legend is why Chinese people started causing explosions on the eve of the New Year and hanging up red-paper signs. After gunpowder was invented 2,000 years ago, firecrackers replaced bamboo. Many people still believe that lighting firecrackers and fireworks will scare away the evil spirits of the past year and celebrate the coming of the new year. In fact, Nian, the name of the monster in the legend, is the word that the Chinese use for “year” (年). 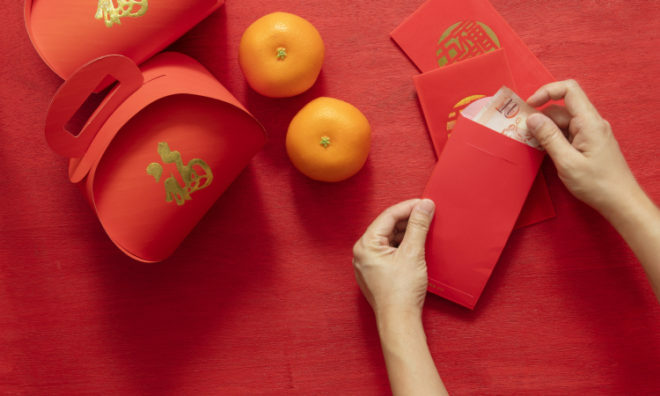 The color red became associated with ensuring good luck and banishing bad luck, so besides displaying decorations of that hue, celebrants began wearing red clothing and giving out red envelopes. The Lunar New Year is now the most important annual festival in China and in many other Asian countries. During the holiday, millions travel to reunite with their family members. The number of journeys made by people in China in 2017 for the New Year was nearly three billion, in what’s thought to be the world’s largest annual human migration. When I was a child in Taiwan, my parents would put me and my two sisters in the car and we’d drive to visit my grandparents for New Year’s Eve. Because there was so much holiday traffic, the 220-mile journey could take up to 12 hours. For three little girls, it felt like we were stuck in a giant parking lot on the highway, and I used to complain. But after I grew up, I became appreciative and grateful that we, as a family, were always together for the beginning of the new year. After the elders distributed the red envelopes, it was the time to worship our ancestors. We’d all kneel on the ground in front of a monument inscribed with their names and bow to them. Then my cousins and I would run around the courtyard and play before the giant luncheon, which is the equivalent to Thanksgiving dinner in the US. There are many traditional dishes that families serve at the meal to guarantee an auspicious year, including whole fish (the Chinese word for fish, “Yu” or 魚, is a homonym for the word that means abundance or surplus); noodles (which symbolize long life); dumplings (representing wealth because they’re shaped like ingot, the blocks of gold used as ancient Chinese currency); whole chicken (symbolizing reunion); hot pot (also symbolizing reunion); and a sticky New Year cake called Nian Gao (年糕, which means doing better year by year). There were also many New Year’s superstitions we followed. These included doing a massive house cleaning before New Year’s Eve (you’re symbolically getting rid of the old and bad and embracing the new and good), not throwing out garbage for the first five days of the year (or you risk throwing out any good luck); and when eating fish, never consume the entire fish (if you do, your savings will run out before the end of the year). As an adult, I’ve continued practicing many of the same traditions that I grew up with. I still exchange red envelopes; have New Year’s feasts with lucky dishes (especially on the Eve); visit my grandparents, relatives and friends; and hang red signs around the doorframe. Because my mother is a calligrapher, we usually make our own signs — with messages like “Good Fortune” and “Prosperity” — but most people buy them. 2018 is the Year of the Dog. The Chinese zodiac consists of 12 animals: Rat, Ox, Tiger, Rabbit, Dragon, Snake, Horse, Sheep, Monkey, Rooster, Dog and Pig. Why this dozen? It’s said the Jade Emperor decided to hold a race to choose the creatures that would make up a new calendar. There’s no Cat because, as the legend goes, Rat deliberately did not wake up Cat on the day of the race so that Rat could win. To this day, it’s why rats and cats don’t get along. Those born in a Dog year are believed to be loyal, responsible, honest and courageous. It’s believed that the best match for a person born in a Dog year is someone born in the Year of the Tiger, Rabbit or Horse. To greet your Chinese friends during the holiday, you can say “gǒu nián wàng wàng.” Gǒu (狗 means dog); nián (年 means year, and it’s the monster’s name); wàng wàng (旺旺 is how Chinese people say “woof woof,” and wàng is also the Chinese character for “prosperous”). To everyone reading this: I wish you a prosperous Year of the Dog!